During the heady days of WA cricket in the 1970s the melodic click of the wrought-iron turnstiles would echo throughout the WACA as fans streamed into the ground. With the advent of automative ticketing in the ‘80s, the century-old turnstiles were silenced as the gates were ripped up and shoved into storage. Now cricket nuts can have that magical feeling of cranking through the Victorian-style gates again, with eight of the turnstiles built between 1890 and 1920 returning to the members’ entrance. 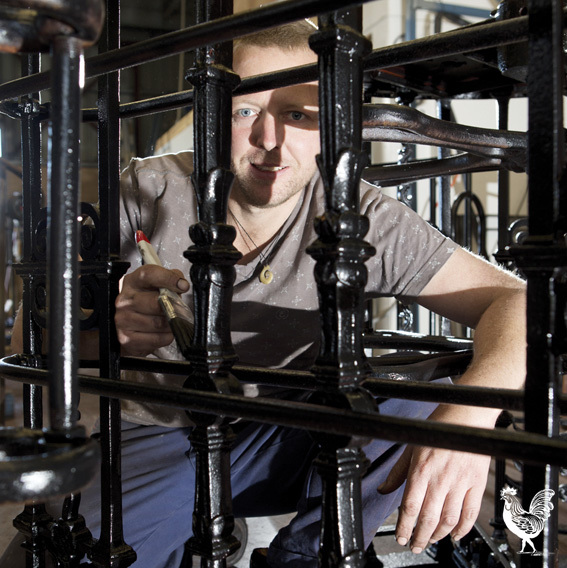 Heritage ironwork specialist Brad Jackson was given the task of reviving the rusted-out baffle gates which will be up and running for the WA vs England game on October 31. “I was a bit shocked by the condition they were in,” he told the Voice. He describes the craftsmanship as outstanding: “Aesthetically it’s a beautiful thing,” he says, running his hand over a recently-painted gate. “It’s a utilitarian piece that served a function, but it is beautifully designed and really well-made. Anything cast iron you would have to have a pattern-maker carve out first in wood perfectly. “With the Ledger one, someone was there with a chisel carving all that out to make a pattern that went to the foundry. “There would have been a month’s work just in that pattern for that one casting. WACA Museum curator Stephen Hall says the turnstiles are an important part of the history of the ground.